When I started 48 Days I was teaching a Sunday School class on finding your purpose and calling. My Why was that I knew then as now that over 80% of Americans say they do not have their dream job. I wanted to inspire that 80% to find or create work that was meaningful, aligned with their purpose and able to generate the money necessary to fund their dream. People who love their work are more productive and more creative. They are more in touch with their God inspired calling. They are happier and have happier families. They have better relationships with those closest and then with friends and community. They treat their customers better. They build stronger companies and are more profitable. They have increased trust and look for the good in others. 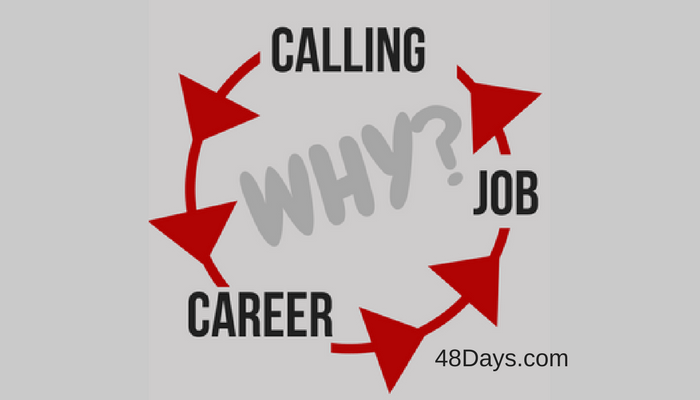 In 48 Days to the Work You Love I distinguished among Calling, Career, and Job – or to be seen a different way as Simon Sinek explains the Why, the How and the What. In a recent conversation with a friend about our work together 23 years ago I was appalled to recognize how far to the right I’ve moved on both of those scales. I’ve slowly moved to the right on the sequence of Calling, Career, and Job. I’ve drifted from helping people discover their WHY – That was my original niche and I feel like I’ve drifted to the sameness of lots of other voices out there. If someone wants to be a coach, we go right to the HOW. What you have to DO to make it work. If someone wants to write a book – we show them what they have to DO to stand out. I want to return to asking WHY – You want to be a coach? – WHY? What it is that is calling you to help people change their lives? You want to write a book – WHY? What is the message that you can’t contain? You want to start a side business – WHY? You want a promotion at work – WHY? I want to once again be the guide to listen for that divine voice. My coaching has been reignited in helping people discover their WHY— the 38-yr-old dentist who knows he’s living someone else’s dream, the 29-yr-old pastor who just got fired and is now questioning his Why. What about you – are you still clear on the WHY that put you on the path you are on?